On Saturday during Ironkids at the McArthur pool complex my eye kept on wandering to the folk having drinks on the deck at Cubana. 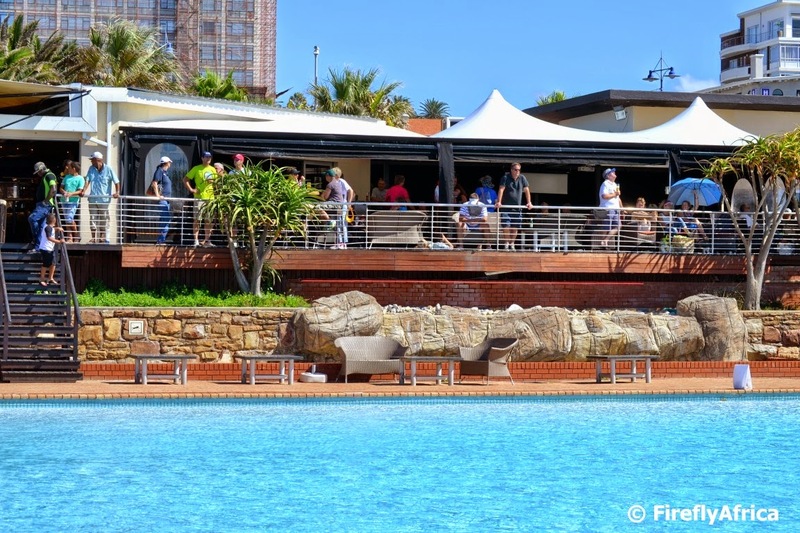 It must be one of the best spots for a drink with its view of the pools and Kings Beach beyond. After spending 5 hours next to the road supporting the Ironman competitors on the cycle leg and popping home to do a couple of things like mow the lawn, we headed down to the beachfront after sunset to cheer on the runners. My mouth just hangs open year after year watching people who have already swum 3,8 km and cycled 180 km still run 42,2 km as if its just a jog around the block. You can see some of the athletes are struggling along and won't give in, but then you get those who still give the supporters next to the road a smile and wave. The best part last night was when I overheard a female runner at about 9pm tell the people next to the coarse, "You guys are awesome. You've been here supporting us all day." I tell you, on a day like this everybody is an Ironman doesn't matter if you're competing, organising, working at the event or supporting. This truly is an event Port Elizabeth can't afford to loose so let me add my voice in objecting to the proposed fish farm that government wants to put up off Hobie Beach. I hope these idiotic government officials wanting to do this came and saw what an event like this means to the city and realize what a loss it will be if they put up the fish farm and events like Ironman starts pulling out. 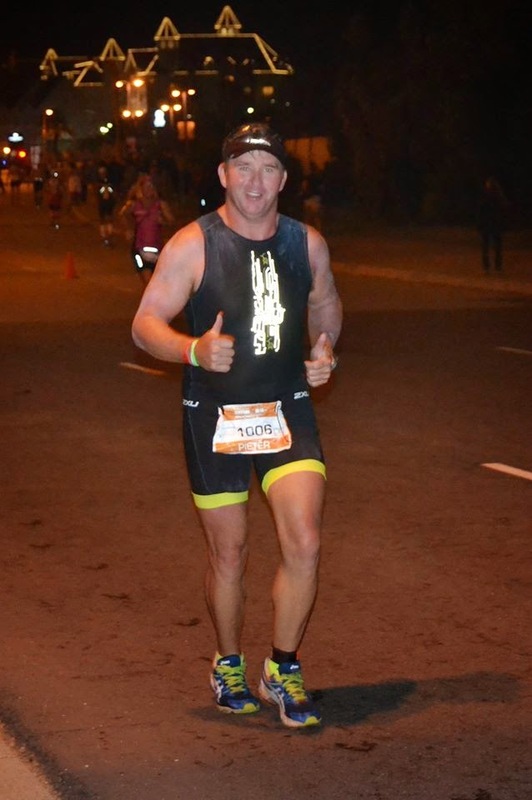 Congratulations to our friend Pieter Klinkenberg who did (and completed) his first Ironman yesterday. Pieter, I applauded. You truly are an IRONMAN!!! 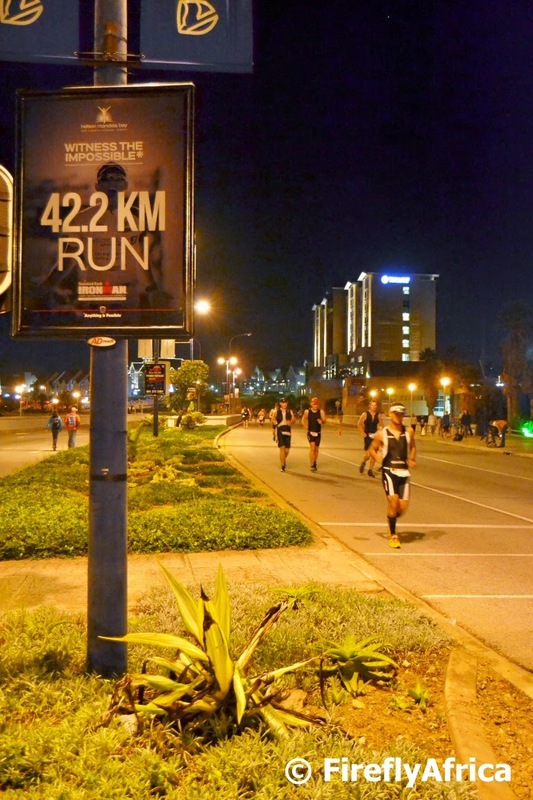 Today is Ironman Sunday, one of the biggest sporting days in Port Elizabeth. We decided to spend most of the day supporting these inspirational sportsmen and women and headed out early to cheer on the guys and girls on the cycle leg on the intersection of Buffelsfontein and Walter Road in Charlo. This is the chasing pack of 11, a couple of minutes behind the first four on the second cycle loop. We spent about 5 hours out there and got nailed by the sun, but it was so worth it. We also headed down to the beachfront for the running leg after dark, but I will post about that on Monday. It's Ironman weekend in Port Elizabeth and the vibe in town around this iconic event is absolutely mind blowing. In addition to the main event on Sunday, there are also two events taking place on Saturday. First off was the Corporate Challenge followed by Ironkids in the afternoon. 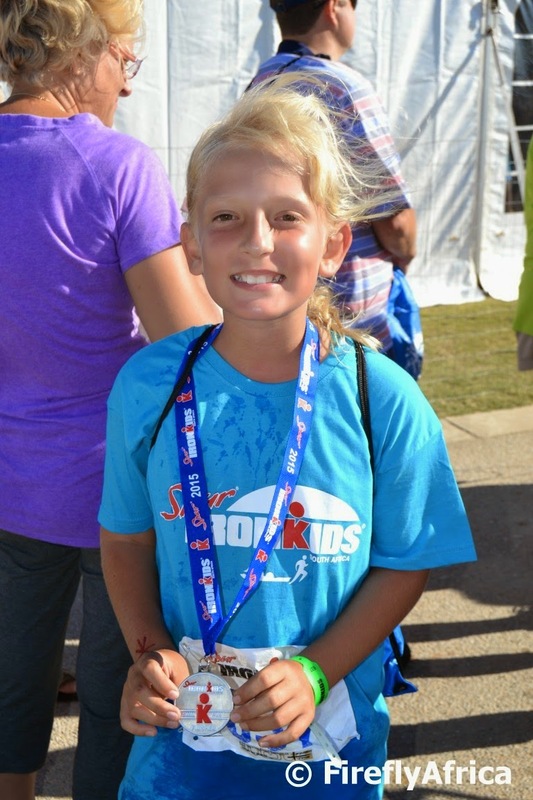 Drama Princess entered Ironkids after missing last year and this year had to do the slightly longer 100 meter swim and 2 km run as she just turned ten and thus moved up into the "senior" group. Spur Ironkids South Africa is the biggest Ironkids event in the world and with 1 000 children between 6 and 13 years old taking part it isn't hard to understand why. 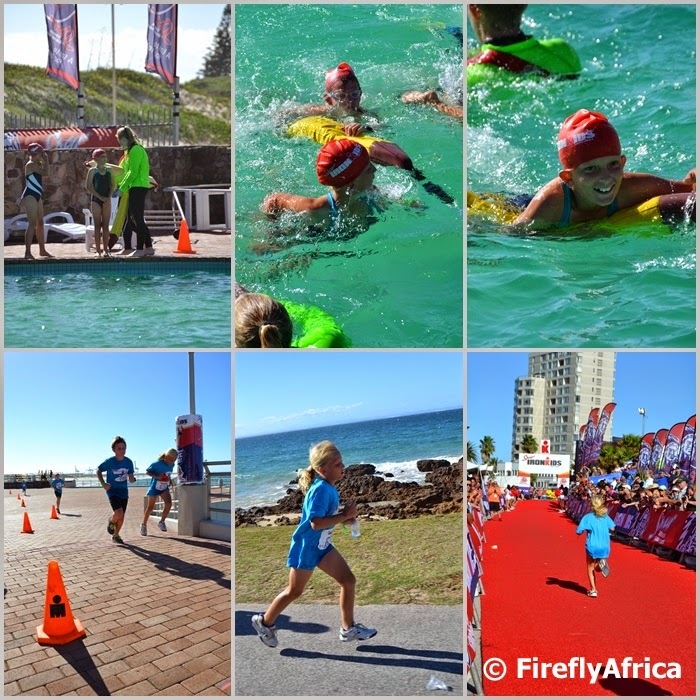 The swim took place at McArthur's Pool and then they ran along the beachfront promenade to finish under the same arch at Hobie Beach where the Ironman competitors will on Sunday. The kids set off in waves of 20 which meant that we had a bit of a wait for Drama Princess to get her turn. Swimming isn't her strongest discipline so we could see how she made sure she was close to one of the lifeguards accompanying the kids during the swim before the even got into the water. Once in the water she quickly decided to take a breather and grabbed onto the floaty, catching a lift for a while before swimming the last bit to the transition area. I meanwhile changed camera lenses and made sure I was in front of her on the running course by the time she had her shoes on and came flying up the ramp to the promenade from the pool area. This year I'm a lot fitter (and lighter) than the previous time I ran this with her so I could stick with her without huffing and puffing like a steam locomotive. Her run went very well and I'm starting to realise more and more that she is a middle distance runner in the making (in addition to her netball, cricket and now also tennis). All in all it was an awesome day and we're all looking forward to watch some Ironman action tomorrow. Drama Princess... You're an Ironkid!!! It is Ironman weekend in Port Elizabeth and the buzz outside my office at the Boardwalk has been awesome over the last two days. Tomorrow the day kicks off with the Corporate Challenge (or Corporate Ironman as everybody but the organisers like to call it) followed by Ironkids. With Drama Princess taking part in the latter I will be down on the beachfront with my camera so look out for pictures on that in the coming week. 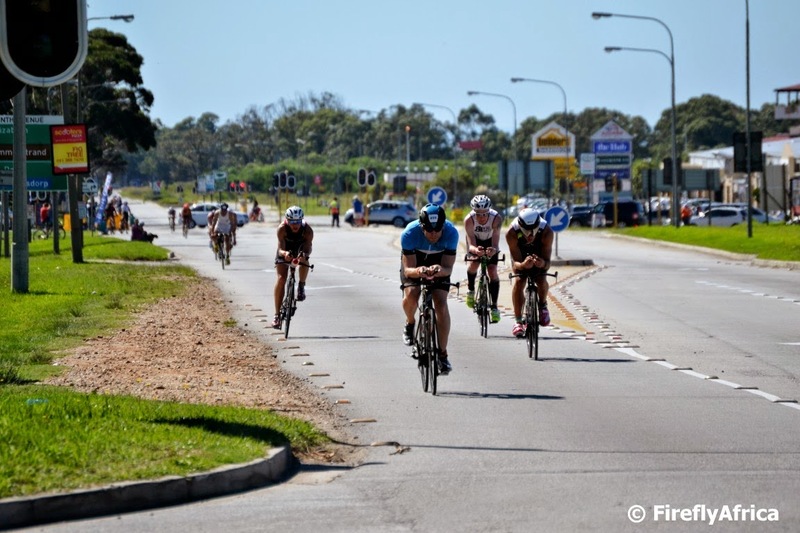 On Sunday morning its the big race with Ironman African Championship taking place with 2000 competitors tackling the 3,8km swim, 180 km cycle and 42,2 km run. It is going to be epic. I know I posted this stunning Ironman African Championship video a couple of months ago but I'm sure you won't mind it if I share it with you again. Below are the new Ironman African Championship - Witness the impossible video as well as a SABC news item from this morning. This is how you cool off on a hot day. Floating in one of the Maitland River pools on at Sleepy Hollow. I've visited Sleepy Hollow a couple of times now and the one thing I would still love to see is an otter. How do I know there are some? 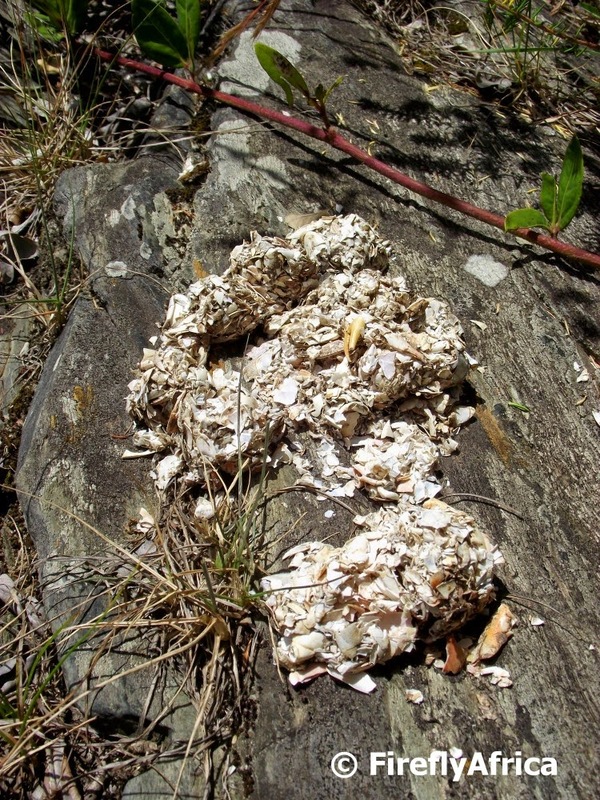 Because last time I found otter droppings on the rocks around one of the river pools right up in the valley. One of the pools in the Maitland River as it flows through Sleepy Hollow farm. One of the main features at Sleepy Hollow outside PE is the old abandoned silver and lead mines dating back to the late 1700's. 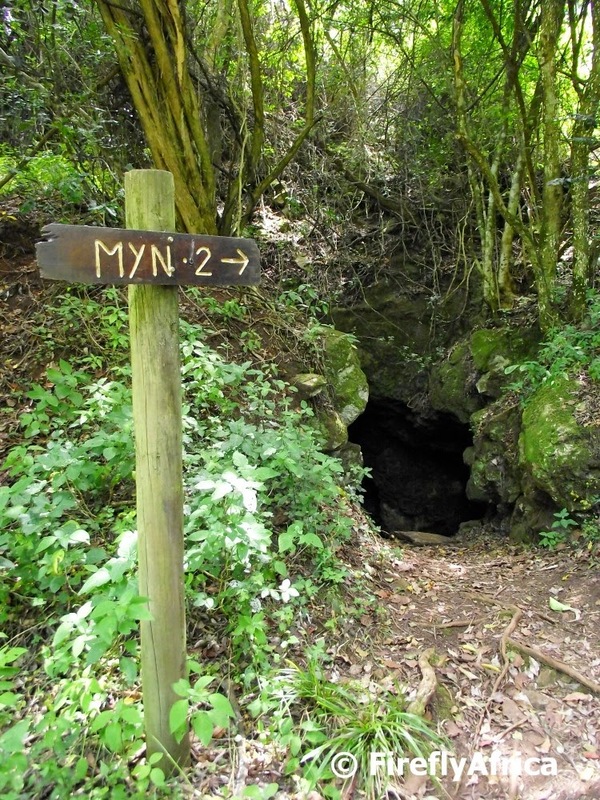 When we go and camp at Sleepy Hollow we normally take our strong torches along to go for a walk down the old mine shaft. Last time I was there I didn't venture too far in though as I forgot my torch and there were a couple of bats sweeping in and out in the late afternoon. Without a torch one never knows what else you'll encounter so I rather stuck around the entrance taking photos. We are busy organising Chaos Boy's 13th birthday party and decided to have a day out with his friends at Sleepy Hollow in the Maitland River Valley. I went to dig out a couple of photos I took at Sleepy Hollow in December when we last popped in there for a visit. I went for a walk up the river with Drama Princess and she is always willing to play the model if I need one for a photo. This is one of the main intersections on the trail into the valley from the campsite. Sleepy Hollow offers both campsites and picnic sites for day visitors. Activities include shorts hikes around the farm and up the Maitland River which runs through it, a walk up to Sleepy Hollow waterfall, exploring the old mines and swimming in the river pools. There is also a very popular slippery slide where you just can't get the kids away from once they start going. The place is absolutely stunning and you can really get close to nature while still being close to the city. 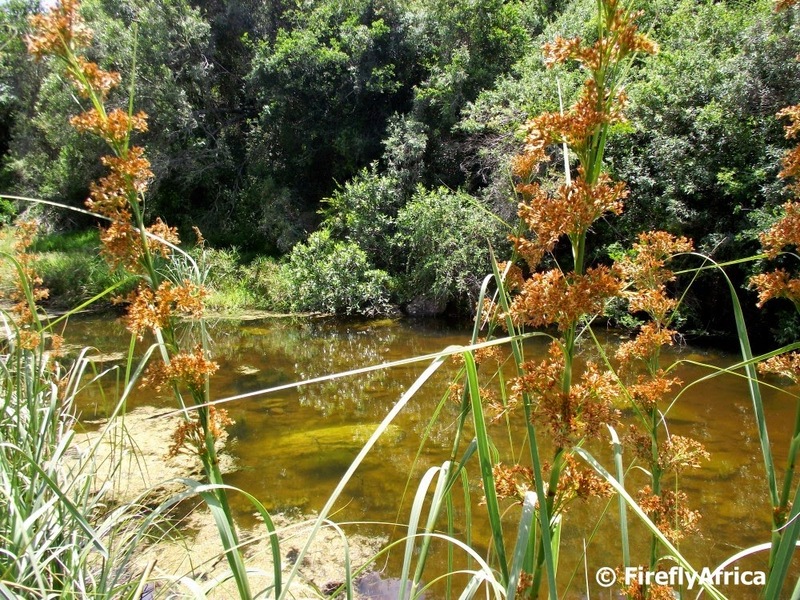 On our last visit I spotted Knysna Loerie, a Eagle owl, heard a fish eagle, spotted a young water monitor and found otter droppings. We even had to duck for a bat that came flying out one of the mines when we were standing by the opening. Oh yes and Geocachers can look for the three caches I put on the property. I have a couple of other pics from my visit to share so I think I'll do a Sleepy Hollow series this week. 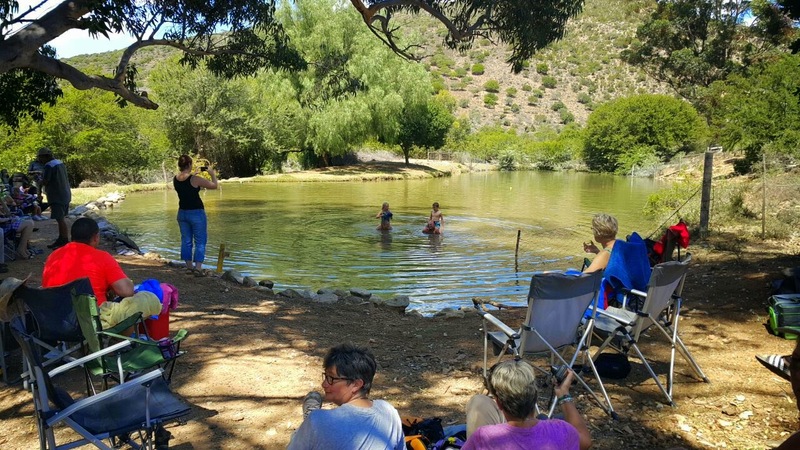 A couple of weeks ago the Port Elizabeth cachers spent the most amazing weekend at Welgelegen Camp on the Cockscomb Road outside Uitenhage. We enjoyed lots of hiking, lots of caching, lots of laughs and lots of celebrations. Welgelegen Camp normally caters for groups so it was the perfect location for the PE cacher's first big weekend event. Well done to PumTim and Kitchenboss for organizing as well as all the other cachers who had a finger in the organizational pie and attended. I found this stunning video by Luke Kibble on YouTube. It was shot with a GoPro on a snorkeling outing at Sardinia Bay. Beautiful footage! Think I need to go get the flippers wet before it starts to get too cold. Have you ever walked along Kings Beach all the way to the harbour wall? Not? Then I bet you have never seen Kings Beach from this angle. A little while ago I did just that and sneaked onto the harbour wall for a bit till a security guard looked at us funny. So we turned around and I snapped this pic of Kings Beach as we were heading back to the beach. I find a certain calmness when I get to stroll through a historic cemetery. Its not quite the same soul soothing feeling I get when I am in a forest, but it is better than the hustle and bustle of the city. 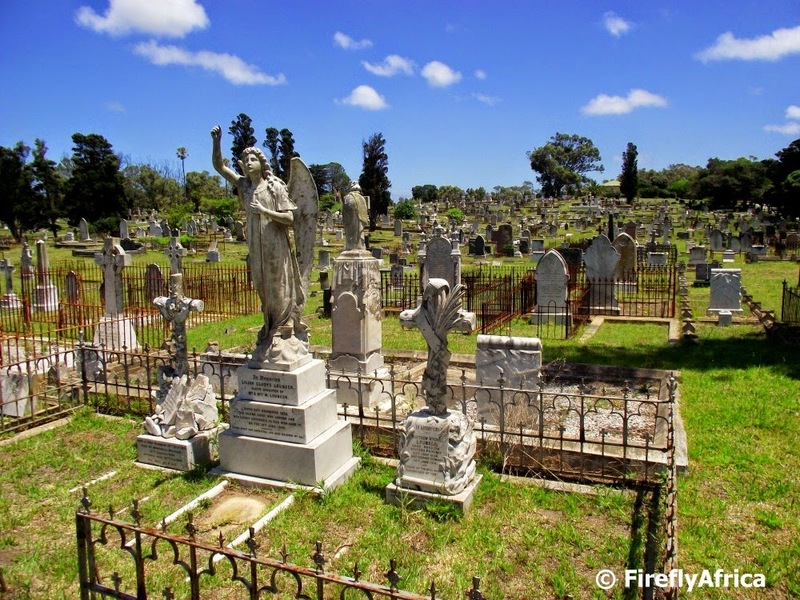 South End Cemetery was established in 1882 and was one of two large multi-denominational and multi-ethnic cemeteries laid out in Port Elizabeth at the time. The other was North End Cemetery in 1863. At South End a simple fourfold division between the Church of England, Nonconformist, Roman Catholic, and Muslim was adopted. This pattern was retained until the 1990's when "activity" (at a loss for a better word) was moved to Forest Hill Cemetery. A scene from the upcoming Jurrasic World movie? Not quite. 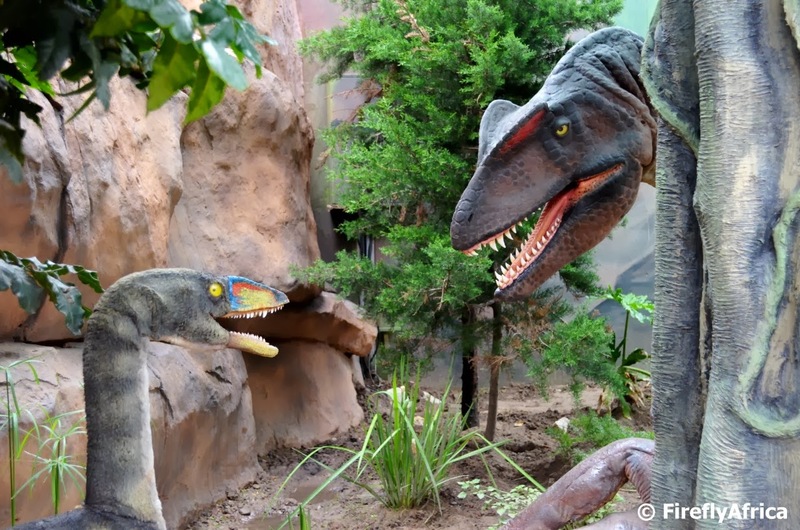 It's scene from the dinosaur section at Bayworld. Usually I post about places or buildings or monuments. Today I'm posting a spider. 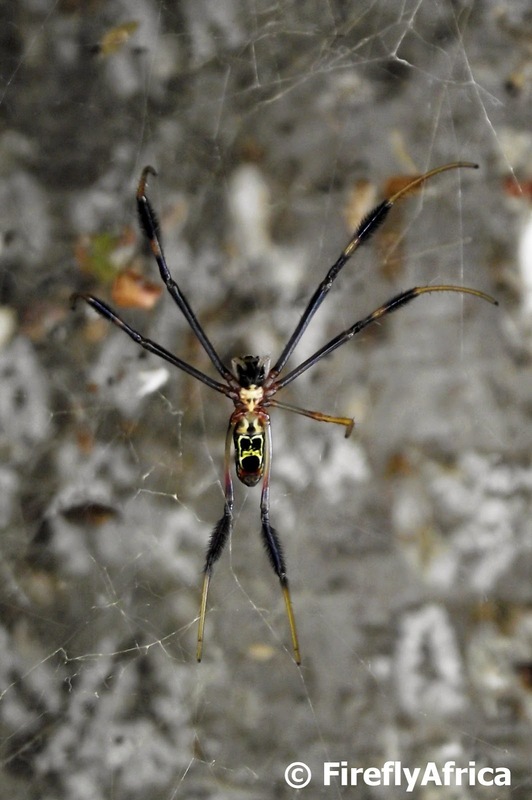 A golden orb web spider I encountered in a wild fig tree in Uitenhage. This guy stood out on the rocks at Willows fishing for ages. I would never be able to do that. Just don't have the patience for it. 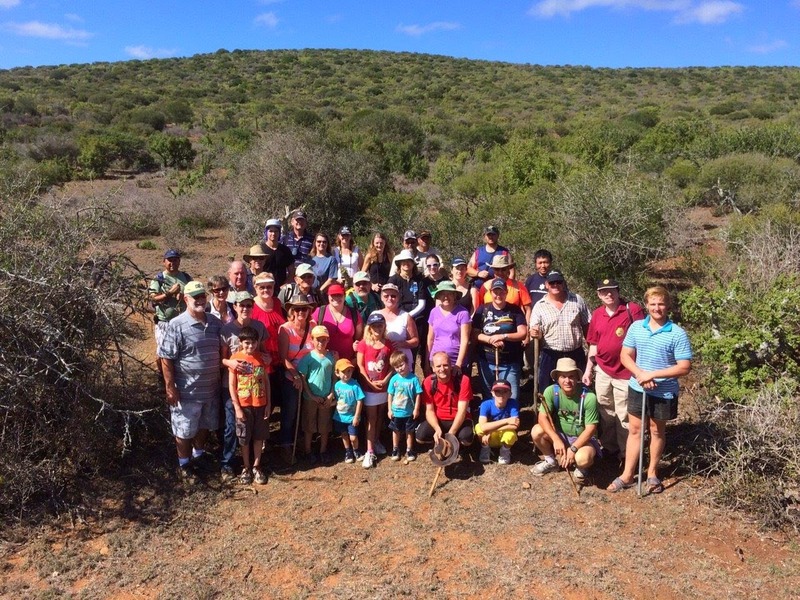 Two weeks ago during the Port Elizabeth geocachers' Welgelegen Camp getaway I had the privilege to log my 1000th find. The cache was located on a farm dam where we relaxed a bit between all the caches we had to do during the weekend. On our arrival at the dam the cache was spotted immediately where it was floating right in the middle of the dam. If you look carefully at the picture you will notice the little yellow spot in the background. Yes, you guessed it. 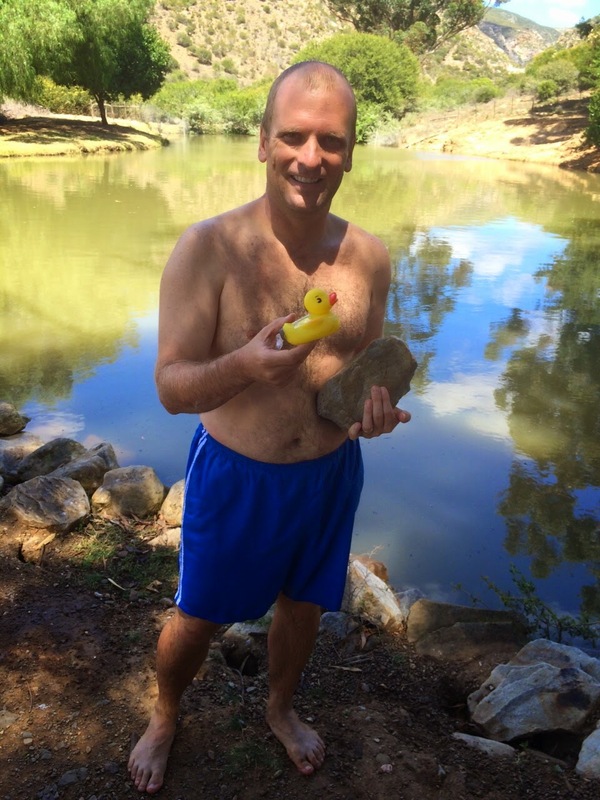 The container was located inside a little yellow rubber duck tied down with a big rock. Tow of us swam in immediately to retrieve the container for everybody to sign the log. A big smile for a big milestone... and I'm not referring to the one attached to the duck. It has taken me just over two years to get to 1000 caches. Here's to the next 1000. The Sardine Run is one of South Africa's biggest annual natural events and takes place on the KZN coastline and the Wild Coast. 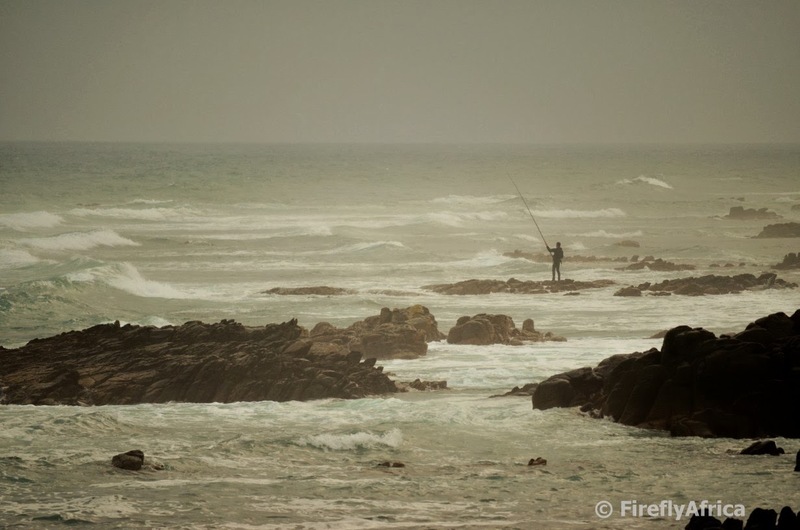 Very few people actually know that the sardines gather on the coastline off Port Elizabeth early in the year before they start their journey up the east coast. Expert Tours is a marine tour operator that does tours to go and see the gathering of sardines along with the dolphins, sharks, whales, birds and other predators that follow and feed on them. Check out this video showing their boat cruising along with a pod of common dolphins off the PE coast. 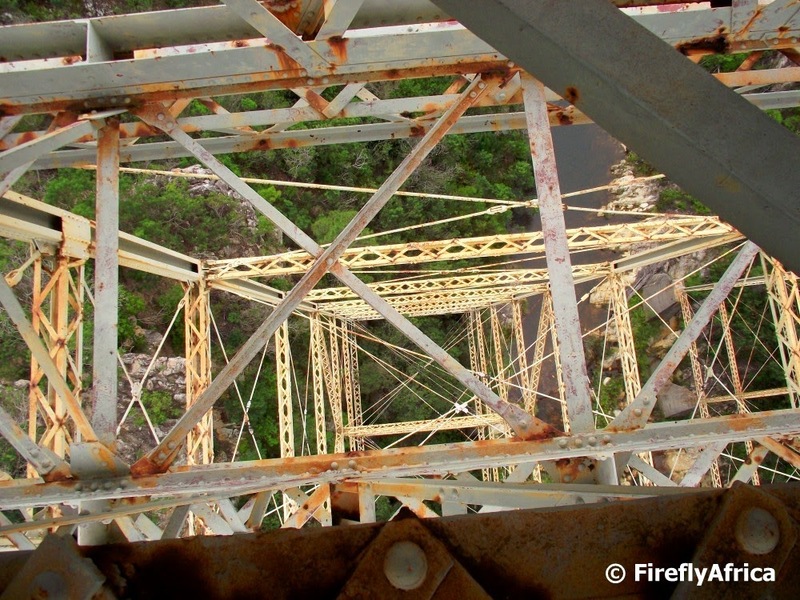 Have you ever wondered what it looks like standing on the Van Stadens Railway Bridge and looking down from it? Probably not but it's something I did when I took a walk across it a little while back. The Port Elizabeth to Avontuur narrow gauge railway line was authorised in 1899 and construction commenced in 1902, reaching the town of Avontuur in the Langkloof late in 1906. 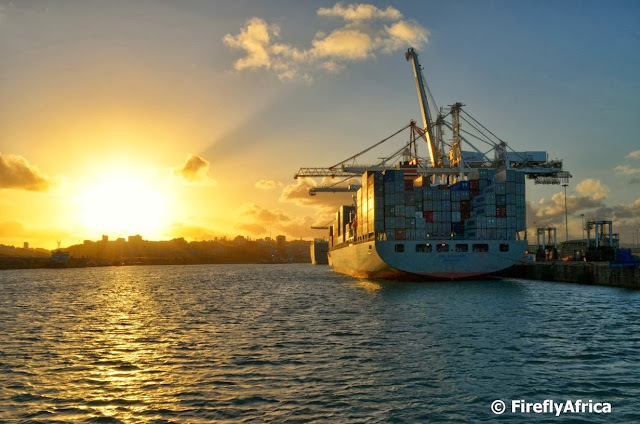 The line was built to connect the scenic Langkloof with its fruit growing industry to the port of Port Elizabeth. The official opening of the line was in 1907, with a main line track length of 284km (177 miles) from Port Elizabeth to Avontuur. The 30km branch line from Gamtoos Junction to Patensie was completed in 1914 to serve this citrus producing area. The establishment of the deciduous fruit industry in the Langkloof, and the use of the narrow gauge to transport fruit to the cooling sheds in the Port Elizabeth harbour for export, led to the popular name of the Apple Express. It was also the name of the little tourist train that we so badly would like to have back running again. 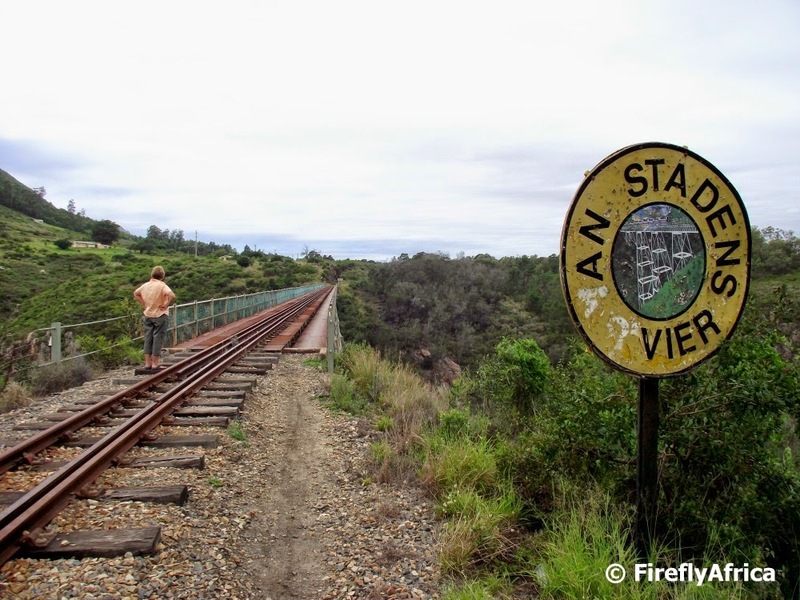 The Van Staden’s railway bridge is the second highest railway bridge in South Africa, and the highest narrow gauge bridge in the world. Construction on the bridge was completed in 1905 with it being 156m long, 77m high and containing 1 112 cubic metres of concrete and 574 tons of steel. I took this photo late afternoon as the sun was setting over the city as seen returning to the harbor after cruising along the beachfront on the Jester. 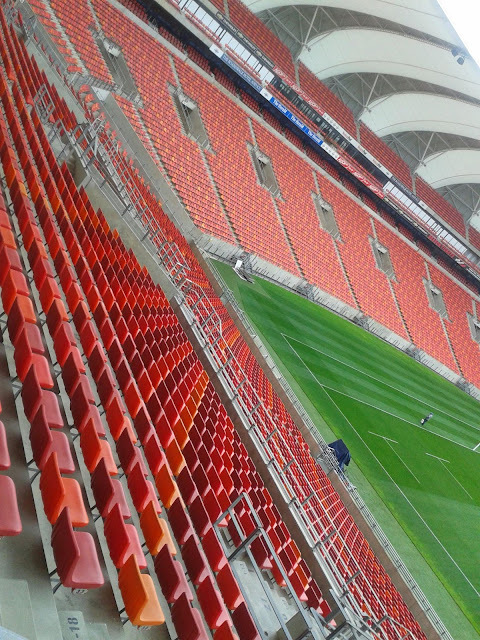 A little while ago I got to go on an Instawalk around the Nelson Mandela Bay Stadium and was looking for something a little different than just a straight forward stadium photo. Just holding the camera at an angle did the trick for me. What do you think? 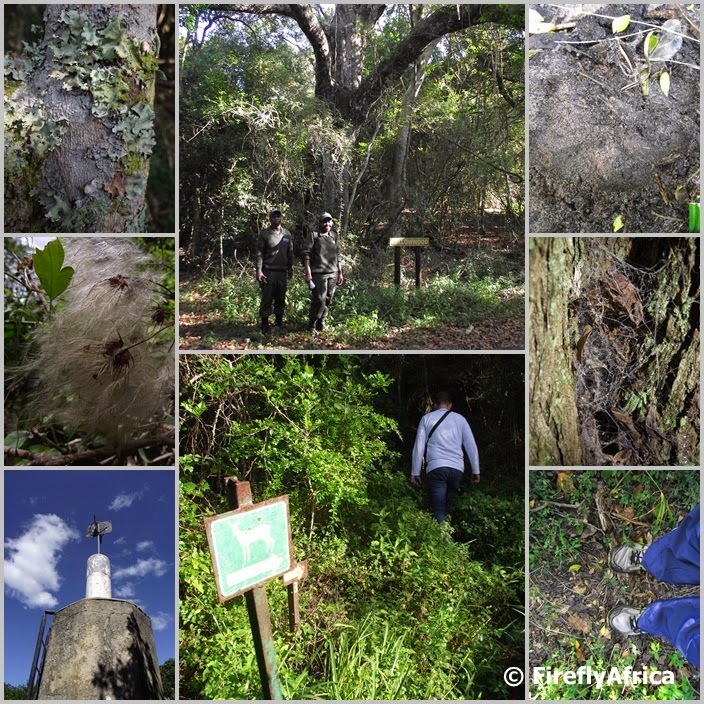 Last weekend we attended a Geocaching weekend at Welgelegen Camp on the Cockscomb road outside Uitenhage. Over the weekend we got to do over 50 new caches and events along with walks in the game area and spending time with good friends. Geocaching heaven. On the way back from the camp there is 20 km dirt road before you hit the tar and host cachers Kitchenboss and Pumtim, with the help of a few others, made sure it wasn't all over when we packed up. They had about 16 caches waiting for those who felt like doing a couple more on the way home. 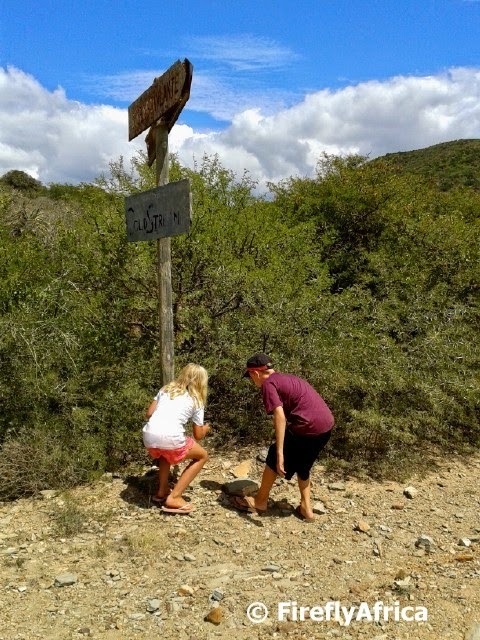 Here Chaos Boy and Drama Princess is diving in to find one at the Steenbokvlakte turnoff. While looking for a video to post for today I found this video postcard by Hostelworld. Its just over three minutes long and covers beaches, history, game reserves and a couple of general attractions around the city. It's not an expensive and flashy production but really shows off what the city has to offer. Something a lot more people aught to do. Destination marketing should be something every tourism product and establishment in the city should be doing as tourists choose a destination and what they want to do first before choosing where to stay and where to eat. Enjoy the video and have an awesome weekend everybody. 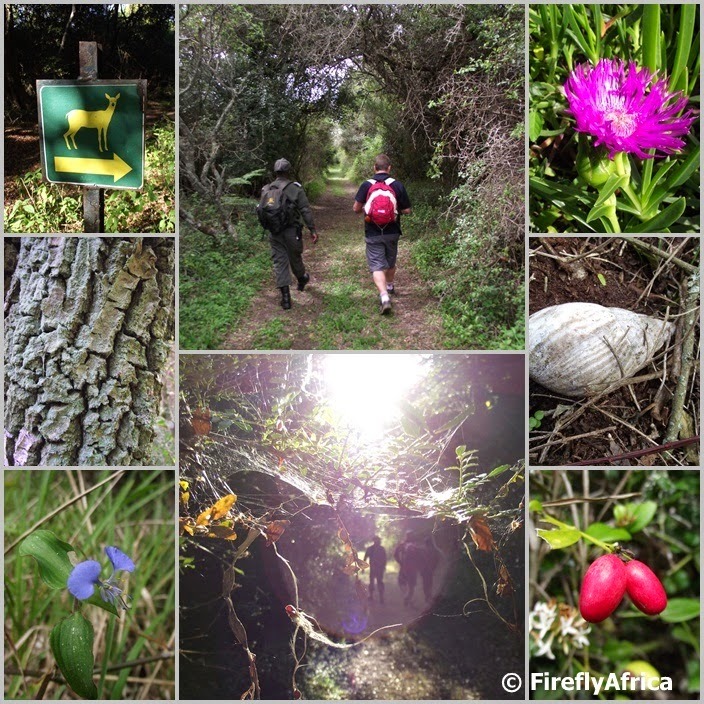 Today's post is the second of two picture collages I made after my walk on the Bushbuck Trail in the Island Nature Reserve a while ago. I posted the first collage yesterday but have to apologise right off the bat. For some reason I referred to the trail as the Grysbok Trail yesterday and didn't pick it up till a friend phoned me this morning to point it out. How could I mix the names up like that? Who knows. 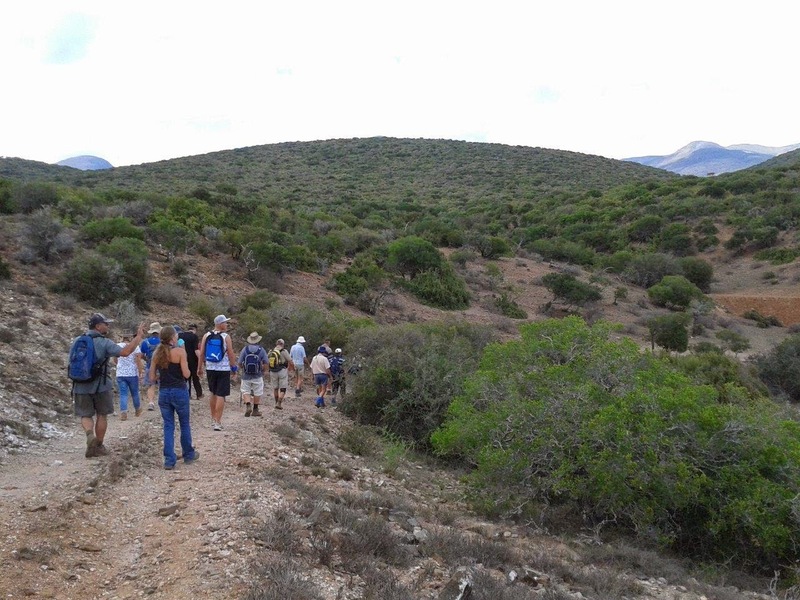 The Grysbok Trail, for those who don't know, runs through the Nelson Mandela Metropolitan University Nature Reserve while the Bushbuck Trail in picture is located west of the city near Seaview. 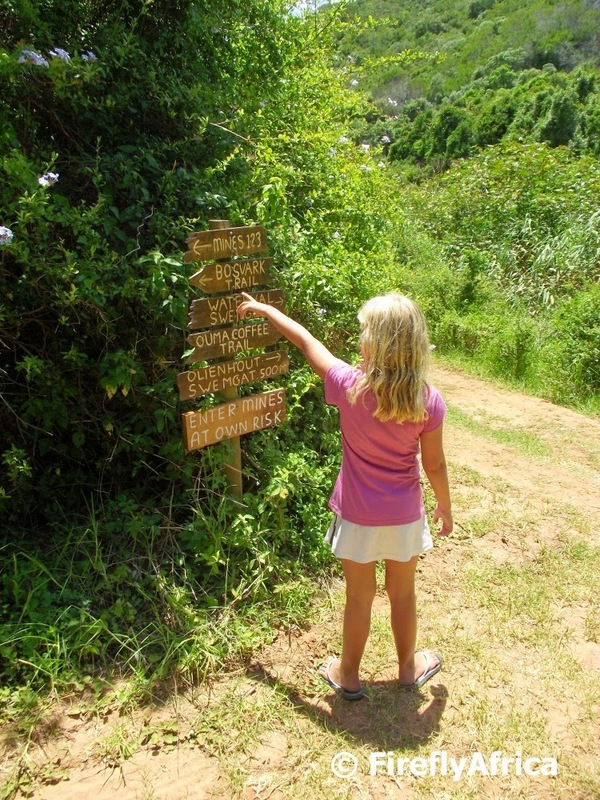 A little while ago I got to go for a hike on the Bushbuck Trail in The Island Nature Reserve near Seaview. 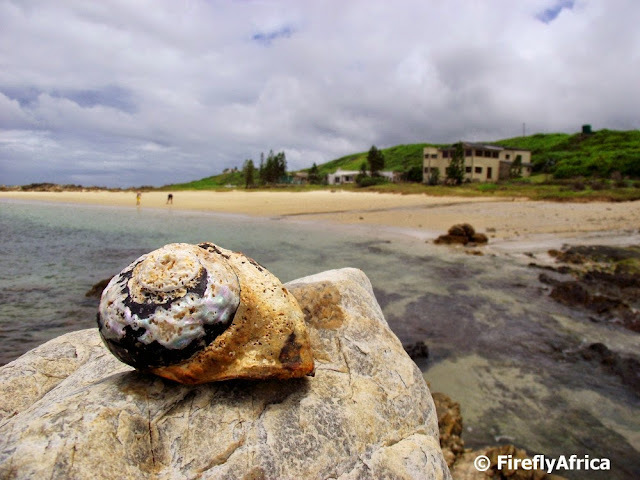 The Island is located about 25 km from Port Elizabeth and is accessed via the Seaview Road. 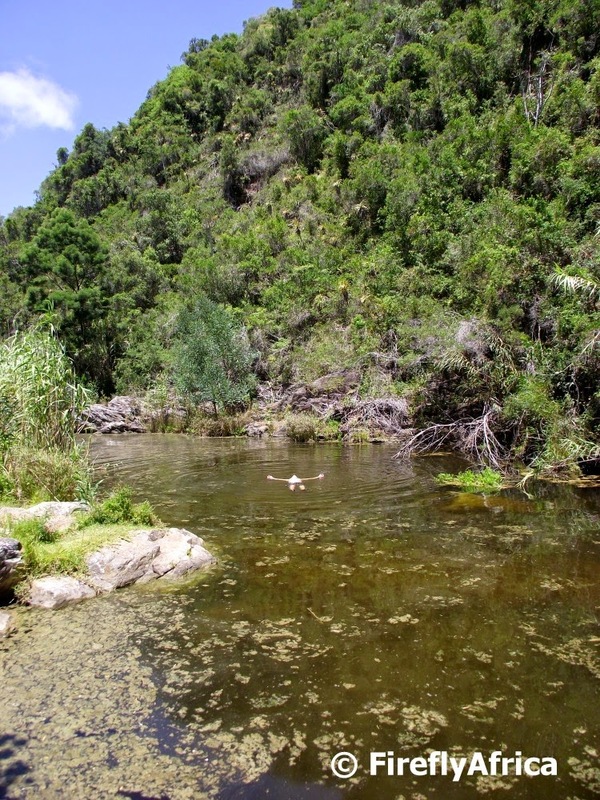 The reserve forms a sub section of the Baviaanskloof Mega Reserve and comprises 480 ha of indigenous Alexandria coastal forest boasting tree species such as Outeniqua yellow-wood, white and hard pear as well as white milkwood. Fauna include small blue duiker, bushbuck, vervet monkey and bushpigs with more than fifty species of birds having been recorded. The reserve offers 5 different trails of various lengths and we decided to do a combination that had us cover a distance of about 10km. 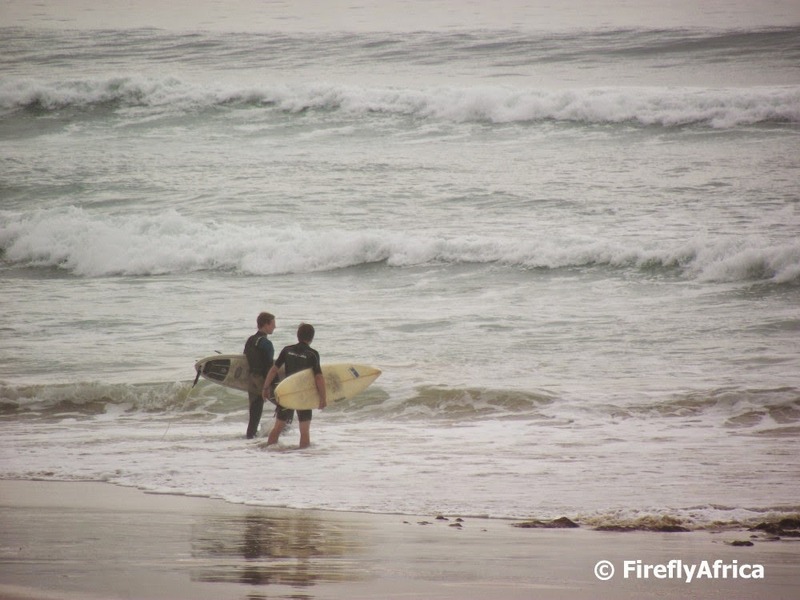 Port Elizabeth may not be Jeffreys Bay when it comes to being famous for surfing, but we do have a couple of half decent surf spots. Pipe next to Pollok Beach are one of those and I snapped these two surfers heading into the waves there a little while ago. 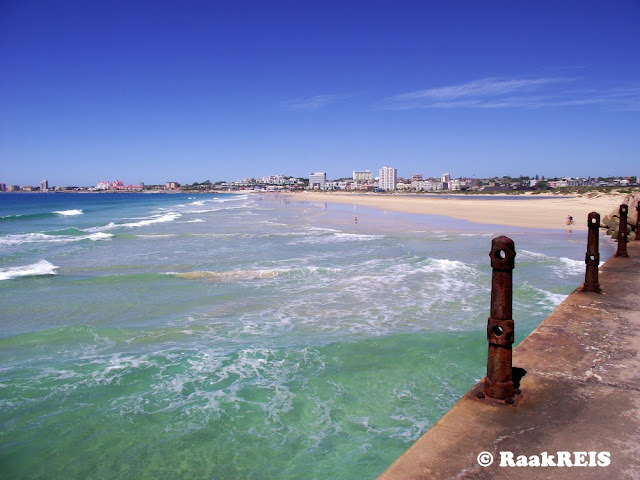 Port Elizabeth has 40 kilometers of sandy beaches and that isn't counting the rocky shoreline in-between. Our main beachfront is our pride and joy with beaches like Kings Beach, Humewood, Hobie and Pollok Beach attracting thousands of visitors every week. And that's just the locals. I wonder how many people remember what Hobie Beach looked like before Shark Rock Pier was built in the 90's. A rocky little beach famous for the fact that many people launched their hobie cats from there. Strange how there aren't as many hobie cats around as back in those days. But I'm digressing. 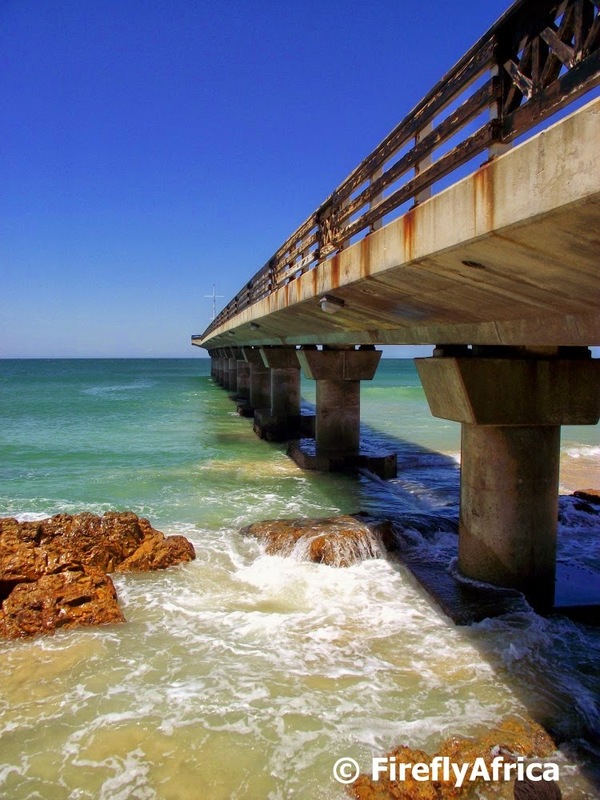 Shark Rock Pier didn't just cause the sand to build up and create what is now iconic Hobie Beach. It has become an icon of the beachfront in itself and probably one of the most photographed objects in the city. It is Sunday the first of March. Flip, can you believe we're two months into 2015 already? Anyhow, I've spent my weekend at Welgelegen Camp on a Geocaching weekend away but not everybody is into caching. Some people spent their time on the beach while others headed out of town or tackled one of the stunning hiking trails we have around the city. Some decided to just chill at home. 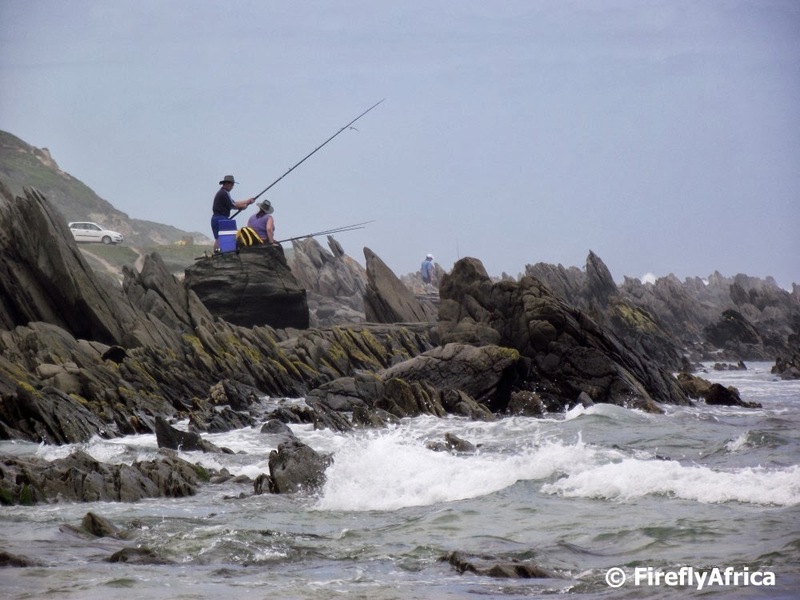 This couple spent their Sunday afternoon fishing off the rocks at Maitland.